Club Penguin Cheats by Mimo777 Club Penguin Cheats by Mimo777: Updated Club Penguin Cadence & Penguin Band Comment Tracker! Updated Club Penguin Cadence & Penguin Band Comment Tracker! Thanks to all you awesome penguins and this Mimo Comment Tracker, even I found Cadence! And, now the Penguin Band is taking a break, so look for them at the Backstage! You will then be able to get their backgrounds. I sure hope they have a new background too! So, let's use the Mimo Comments tracker to find famous penguins! lets find some penguin band. :'( please help me guys! Sadly i havnt found ANYONE! i hope someone leaves a comment soon! oh and mimo is SO lucky! Please say the room too, it would be helpful (if ya know what I mean). Lol. P.S Once i was on alaska trying to find cadence, I went on mammoth to try there, and EVERYBODY there was saying cadence was in alaska in the rooftop, can you believe that?! I sure hope someone comments, SOON (sorry for all caps). i have all the famous penguin backrounds. Candece was just on halfpipe at rooftop. Shes gone now. Looking for her. No, there was a rumor that Cadence would come if everybody on the rooftop got on/off the metal, but CP squashed that last year. Hey Mimo! Guess what? The new pin is actually a band instument! i got the penguin band background on 4 penguins. :) i will tell if i find out where they are. Hey mimo777 i found a cheat in the new costume catalouge in the play. on the 3rd page. there is a penguin all dressed in blue if you click the door handle it shows a secret dark coat for sale. Hi! This is unreleated, but do you remember those plants that Rockhopper gave out a while back? Well the tall tree one is growing purple and yellow fruits! :D Isn't that awesome? Help me! I havn't found any of the famous penguins and i have no idea how to use the tracker? Mimo! Two things, #1: Old Field Op is finally out in QLD. #2: I found a big glitch! I was playing fishing. And I currently had 32 fish so far. Then I went to another tab during the game (accidentally) and I came back with a total of 31 fish! Either that was a glitch or I was fishing from another tab! It's true! The mullet even came in the background! I haven't found anybody yet! - CP+CHEESECAKE=AWESOMENESS! (hoping to be CPG mod)! Cool I Found Franky A Lot Of Times Today! It Was So Cool And Awesome! On the post card that tells other people "Meet me for a sled race!" It has one penguin going one way and another penguin going another way!! I'm confused!? Is that a ! or a ?? Mmmm, French toast! penguin band - alpine backstage hurry! can members only find pb? 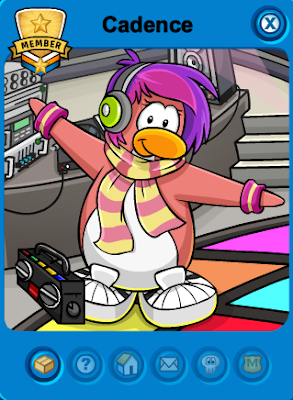 a good tip is the five servers that club enguin suggests because when I was searching them i found cadence! PB at Berg ! I am Not sure If They Are Still There ! And Thx Mimo For All The Trackers ! Last night (7/14/10) And he was told to go meet some new penguins so he did and its was so fun!!! I'm not a member too and they go to nonmember rooms. mamoth!" Or any other server don't listen because the person who said it would be on that server if it was true or it would be full! franky is on french server jour de neige casa fiesta! Or maybe they have 2 internet browsers open at once, like I do. One window has Club Penguin, the other has the tracker. It's possible. Hey Mimo, now I know your a member! When does the next igloo upgrade come out. Sorry this is off topic, but it says in the event section of the news paper "NEW Lighthouse Catalog"
I cant find anyone either! Oh well, just keep trying! I am still trying. Does anyone know where everyone got those hats ? Mimo mentioned this in the newspaper post like 2 or 3 posts before this. But it is cool and wierd! Since when were u a member Mimo? OOPS! I didn't notice you posted it below. Sorry! u dont need to be a member to find PB i found franky at dock. do famous penguins go on safe chat servers? there are a few games that get you a lot of coins with little work. one is puffle round up, its my favorite, tedious, but a good choice. another is cart surfer. also tedious. the easiest book game would be burnt out bulbs. its much easier than lime green dojo clean, and still gets u 800 coins at the end. Penguin band Ice age Dock! Franky JUST left Alpine, he was at the dock. I was so happy I met him, so I went as quick to CPG, but I was clciking all over the place, so I couldn't post it quick enough! Anyway, I still need to find Cadence! Franky is at backstage yeti !!!! Candence on rooftop at Half Pipe! Candence on rooftop at Half Pipe!!! Help me find Candence and Penguin Band before Music Jam is over!!! The Penguin Band is taking a break on Iceberg but I cant find them!! 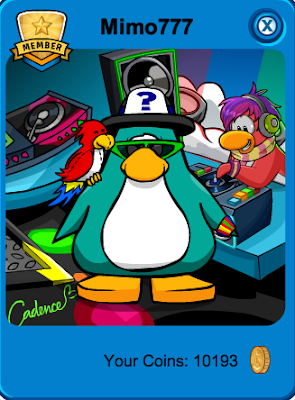 Man I found Cadence a few days ago but I still need to find the Penguin Band. Could someone help me out before Music Jam is gone. Franky was just on mammoth at the forest! Candence at Yeti on rooftop!!! mimo, the comment tracker is a great idea but whenever i see the most recent post, it's from like 4 hours ago. I the web site hooked up to a different time zone? Does the Penguin Band still have the same background? Or do they have a new one like Candence does? i cant find anyone! :( its not FAIR!! anyoneknow where candence or the penguin band is? i cant find them! Whenever I try to go onto a server with someone on it, it's always full! I am so sorry, Mimo! I always used to use the trackers on this one website that had all famous penguin trackers on it. I will never use it again! mimo have you noticed that the penguin bands Stompin' Bob is actually called now Tempo Bob. i dont know if you know this already but im just saying. pb on mammoth dock! so cool! Pb on Beanie on Iceberg. CP time: 7:50pm. were were oh were is pb and c? Hey has anyone noticed that Cadence isn't really a normal name. The normal version would be 'Candace'. Mimo, what are the servers u usually go on?